JOHN 15:20 KJV "Remember the word that I said unto you, The servant is not greater than his lord. If they have persecuted..."
17These things I command you, that ye love one another. 18If the world hate you, ye know that it hated me before it hated you. 19If ye were of the world, the world would love his own: but because ye are not of the world, but I have chosen you out of the world, therefore the world hateth you. 20Remember the word that I said unto you, The servant is not greater than his lord. 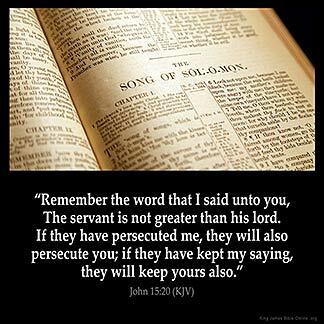 If they have persecuted me, they will also persecute you; if they have kept my saying, they will keep yours also. 21But all these things will they do unto you for my name's sake, because they know not him that sent me. 22If I had not come and spoken unto them, they had not had sin: but now they have no cloke for their sin. 23He that hateth me hateth my Father also. Remember the word that I said vnto you, The seruant is not greater then the Lord: if they haue persecuted me, they will also persecute you: if they haue kept my saying, they will keepe yours also. Remember the word that I said to you, The servant is not greater than his lord. If they have persecuted me, they will also persecute you: if they have kept my saying, they will keep yours also. Bear in mind what I said to you, `A servant is not superior to his master.' If they have persecuted me, they will also persecute you: if they have obeyed my teaching, they will obey yours also. Remember the word that I said to you: 'A servant is not greater than his lord.' If they persecuted me, they will also persecute you. If they kept my word, they will keep yours also. Haue ye mynde of my word, which Y seide to you, The seruaunt is not grettere than his lord. If thei han pursued me, thei schulen pursue you also; if thei han kept my word, thei schulen kepe youre also. 15:20 #John 13:16|; Mt 10:24; Lu 6:40. Joh 15:20 They will also persecute you. The servants must expect similar treatment to that given the Master. The long roll of Christian martyrs shows how this has been verified. As believers we are not promised a trouble free life but whenever we go through troubles we can rest assured the same God that raise Jesus from the dead will see us through. Church stand for Truth and expect persecution from the world, stop yapping that hatred is directed at you, this is a continuation for it hated HIM first, and now HE lives in you, what do you expect? Good news is that we shall overcome because HE did. If the firstfruit be Holy, the rest shall be holy also translation mine . This goes along with tithes also so if Jesus is the "first part ", and the first part was persecuted, then the rest shall be persecuted also. but if the rest is not like the first part, then it has no part in the first. When we take a stand for God we will be persecuted If I am not persecuted for what I stand for then something is wrong There will be some that will receive the word of God that you speak and believe. There is always someone watching you . They watch your manner of walk and talk. Even if they know not God they do know a hyprocrite when they see one . Sometimes I think that the lost world has a 6th sense that can detect certain things. but know this even though they see that your fruit is Good they may still persecute you because you are tredding on their territory and they are under conviction. Jesus was telling us about what we may likely encounter in the future, that is, what the wicked people of this world did unto him, they will also do unto us. if they have persecuted him, we should be expecting persecution. He went further by saying, if they have obeyed his words, they will also obey ours meaning that, we are not greater than him, what happened to him will definitely happen to us.